it’s time to start gearing up for thanksgiving day! i always get an early start planning out my thanksgiving to dos and then spend the three weeks following halloween working towards having everything done for the big day. 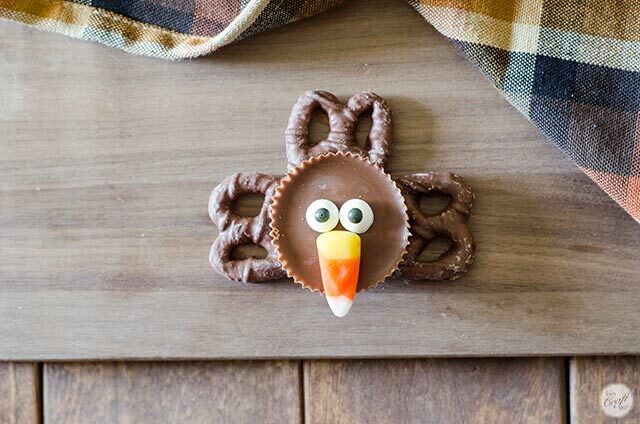 speaking of halloween, we always have so much candy leftover, i like to find ways to use it up, like with this oreo ice cream cake that uses whatever chocolate candy you want, and these adorable turkey favors using peanut m&ms that are perfect for a kids table! 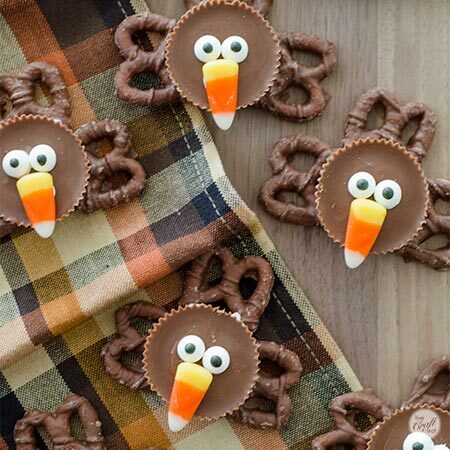 and now, to use up some reese’s peanut butter cups + candy corn, we’re going to be making these oh-so-easy turkeys to have out on the table while the football games are on. just look how cute they are! 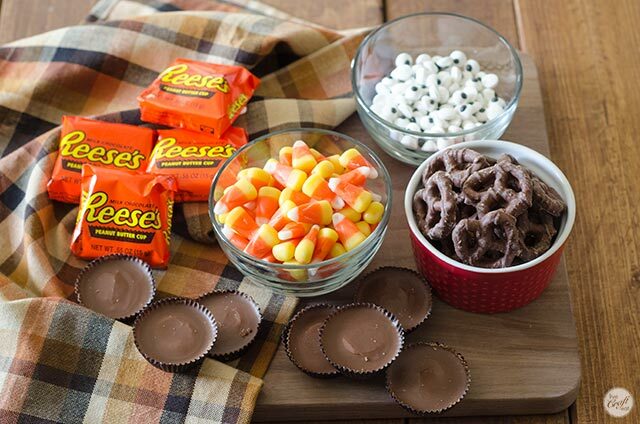 just grab all those leftover reese’s (though, to be honest, those are usually the first things to go in my house unless they’re hidden! 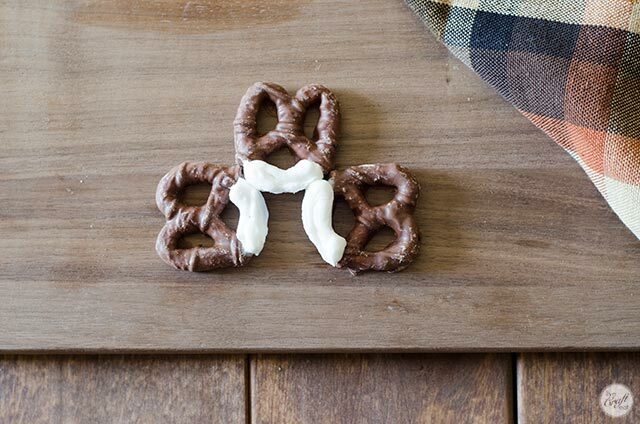 ), some candy corn, chocolate covered pretzels (you can buy them already covered in chocolate, or you can do the chocolate coating yourself), and edible candy eyes (aff link). you’ll also need some icing to use as the glue. i just buy icing in the cake decorating section at any store in a little tube for less than $2. 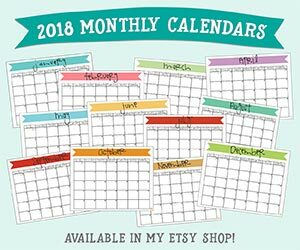 now i’m going to show you just how simple this is to put together! this would be a great activity to keep your kids happy while you’re busy making the dinner or watching the game. 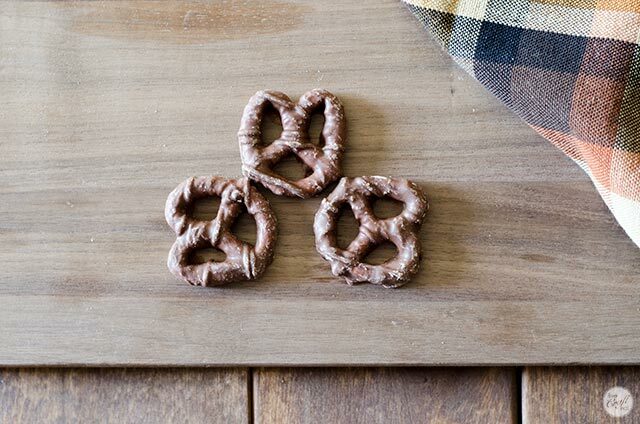 next, add some icing to the inside edges of each one. 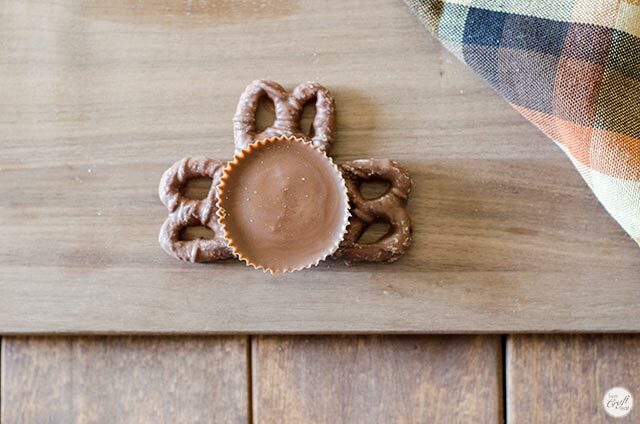 place a reese’s peanut butter cup on top, gently pressing down so the icing sticks to it. 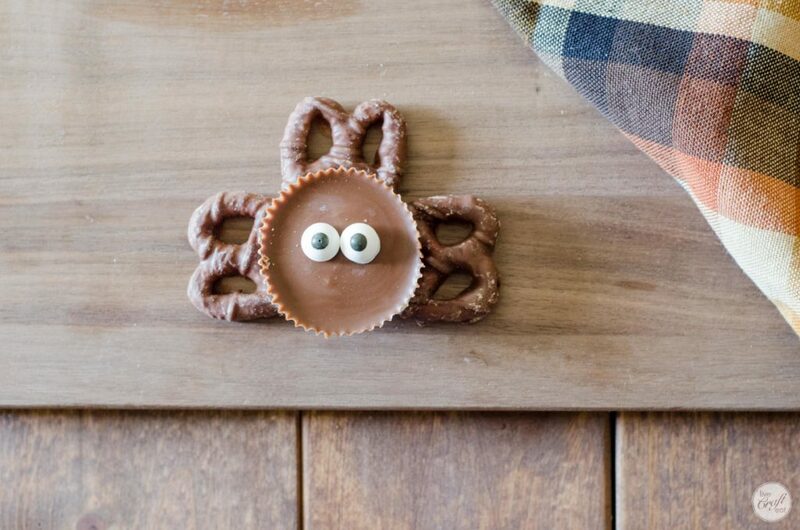 add a small dab of the icing to the back of the edible candy eyes and place them on the reese’s peanut butter cup. 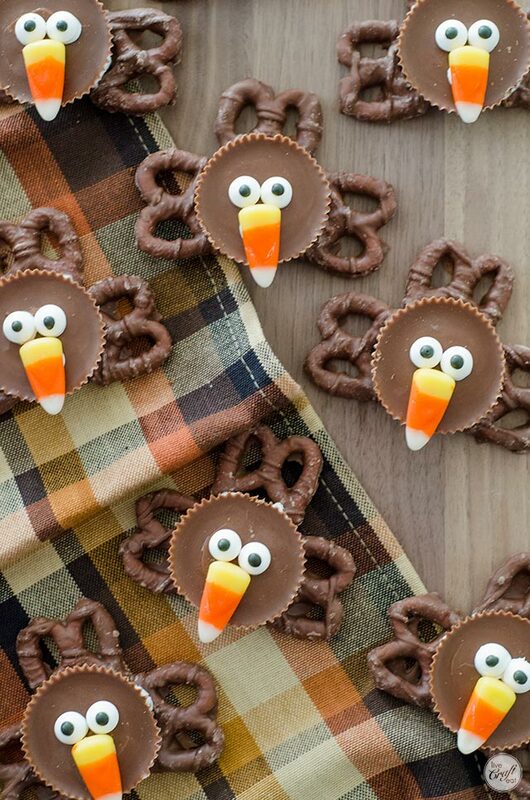 do the same thing with the icing and a piece of candy corn – add a little bit of frosting and place it directly underneath the eyes. now you just need to wait a little while for the icing to set and really work as a glue to keep the whole turkey together. it took about 1/2 an hour for me to be able to pick them up and really stay together. 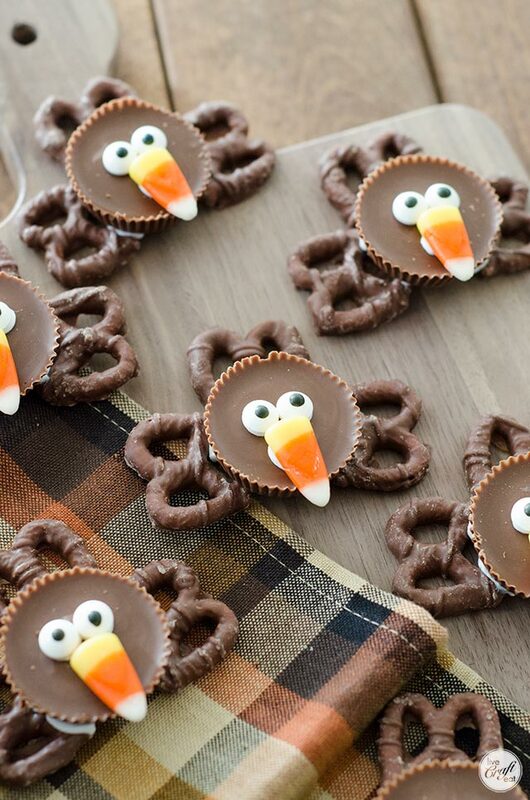 have a happy chocolate covered pretzel reese’s peanut butter cup-filled thanksgiving, everyone! !